Mix into boiled rice fried onion, garlic, tomato paste, mayonnaise, and oil. Blend well to get a nice even texture. Add herbs, and flavor with salt and pepper if needed. Cut "lid" off tomatoes and bell peppers and scoop out the middle part. Place bell peppers in boiling water for a few minutes. Spread olive oil over tomatoes, this way the skin will break less. 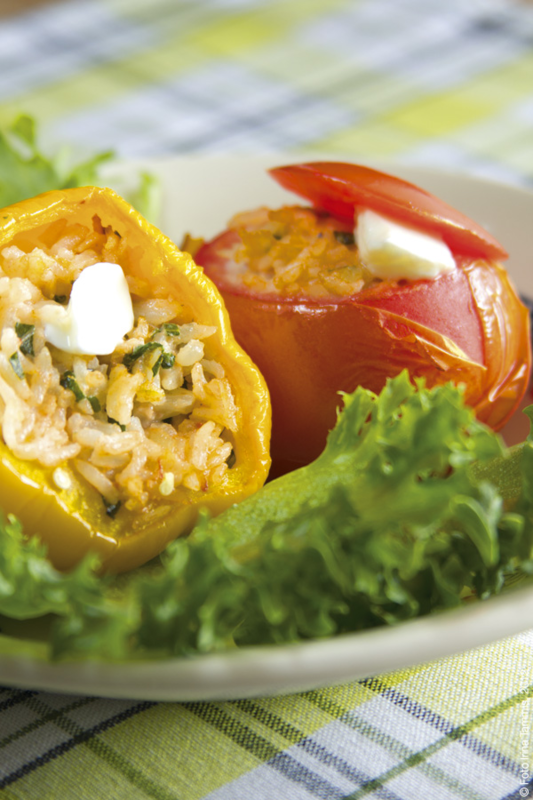 Fill tomatoes and bell peppers with rice mixture, place in a oven dish and bake at 200C for about 30-45 minutes. Garnish with a piece of feta cheese and serve with green salad.